What separates a good leader from a great one? According to psychologist Daniel Goleman, it’s emotional intelligence. According to Goleman, you need to stand out and develop a key area most overlook: emotional intelligence. Travis Bradberry, president of emotional intelligence training center TalentSmart and author of Emotional Intelligence 2.0, says that a lack of emotional intelligence among leadership can cause significant damage to an organization. The result from this can be everything from high employee turnover to increasingly toxic behavior among employees. The good news is emotional intelligence, or EQ, can be learned. All the major skills that comprise emotional intelligence, from being aware of and managing your own emotions, to empathy and other interpersonal skills, can be improved with practice. Today we look at how you can develop and improve yours. There’s a lot you can do to develop more emotional intelligence. However, there are a few things that are most effective. These approaches allow you to develop all, or several, emotional intelligence qualities at once. The ability to manage yourself, through self-awareness and self-regulation, is essential to leading others; the example you set influences everyone around you. Mindfulness is one of the most effective ways to develop both your self-awareness and self-regulation (the ability to manage and respond to our own emotions). By raising your awareness of what’s going on within yourself mentally and emotionally, you’re able to notice changes as well as understand how outside influences affect you. This seemingly simple change can drastically improves how you respond to virtually every kind of social interaction. 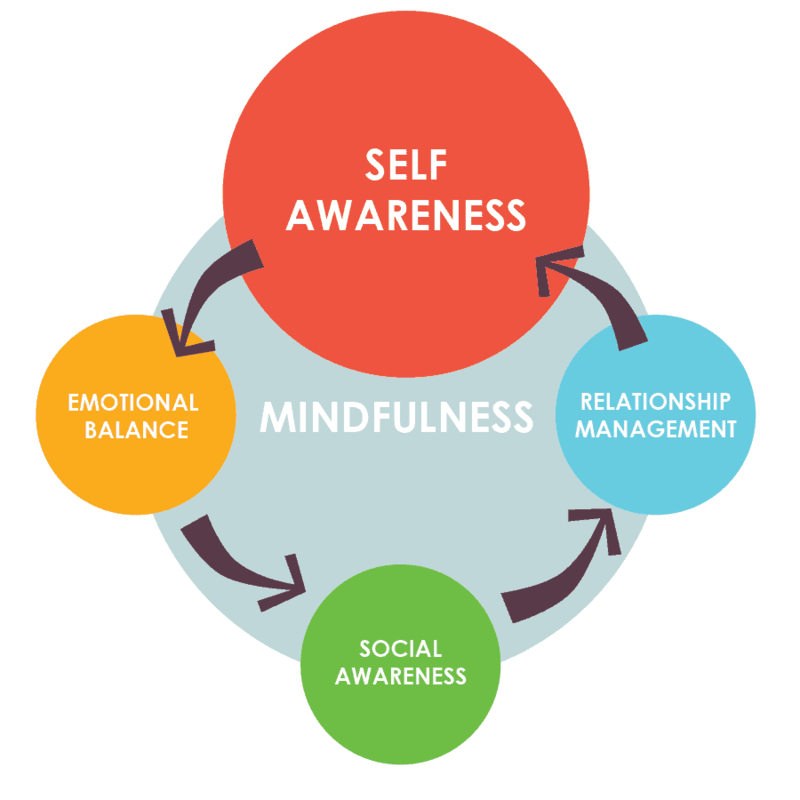 Mindfulness helps you develop in all four areas of emotional intelligence at the same time– self-awareness, emotional control, social awareness, and relationship management. A recent article in the Harvard Business Review found mindfulness was beneficial for developing several leadership qualities. One of those was meta-cognition, which is the ability to monitor our thoughts and feelings. This is a key to developing your self-awareness. But the self-awareness we develop with mindfulness practice helps us do more than just manage ourselves better. It also helps us communicate and work better with others. Another benefit mentioned in the same HBR article was an increased curiosity for the world around us. Specifically, a greater interest to learn about and talk with the people we meet. This, along with the fact that mindfulness has been shown to increase empathy, makes it super effective for helping facilitate clear and open communication. It can also then help you develop stronger bonds with your employees. When you understand yourself better, it’s easier to understand others as well. Leadership and mindfulness researcher Dr. Matthew Lippincottt, studied high-level executives and managers with long-term mindfulness practices. Most described mindfulness as having “life-changing” benefits to their professional life. 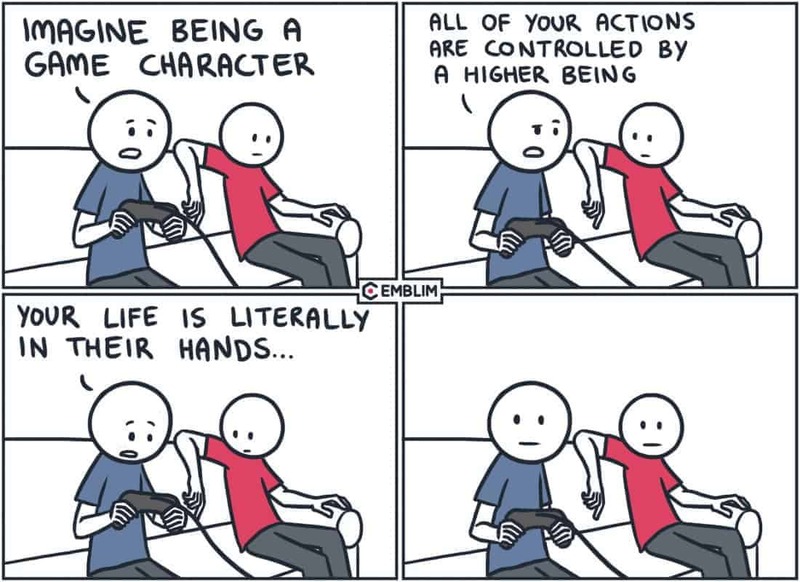 And the self-awareness born from mindfulness is important for other reasons as well. The lack of ability to listen and respond skillfully to others is a sign of one of the most damaging qualities a leader can possess: defensiveness. Set aside some time each week to reflect: think about how the week went, how various situations affected you, and how you affected others. Try meditation: clearing your mind, and relieving tension will help you be more present regardless of the situations you face. You can find more ideas for improving your mindfulness and self-awareness here. The problem, she says, is that many leaders are too defensive to admit they need to make improvements. Unfortunately, it’s their emotions (such as pride or anger), and a lack of self-awareness about those emotions, that get the best of them. By not hearing out the feedback it prevents them from growing and improving as leaders. Unfortunately, it’s easy to become defensive as soon as a team member brings up a challenge they have with you or your management style. We all want to make progress, but we often hinder our ability to make progress by dismissing good feedback when we get it. As you progress in your career, it’s easy to think you have it all figured out; however, just because something worked with one team or employee, doesn’t mean it works in all future cases you encounter. If you’re dedicated to becoming a great manager, you need to be willing to admit when you make a mistake or fall short. You’ll only become as good a leader as you can be when you’re open and honest with yourself and your team. 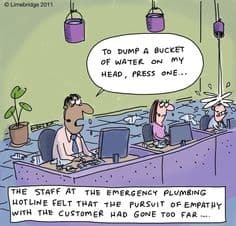 That’s something learning to empathize with your employees can also help with. Pause when you receive feedback. Count to 10 in your head if you need to, so you can let any initial emotion pass. Thank them for the feedback. Let them know you appreciate them having the courage to come to you. Ask clarifying questions and for examples of what they’re describing so you can understand the feedback and the impact it has. Learn more about getting feedback from your team and being less defensive here. 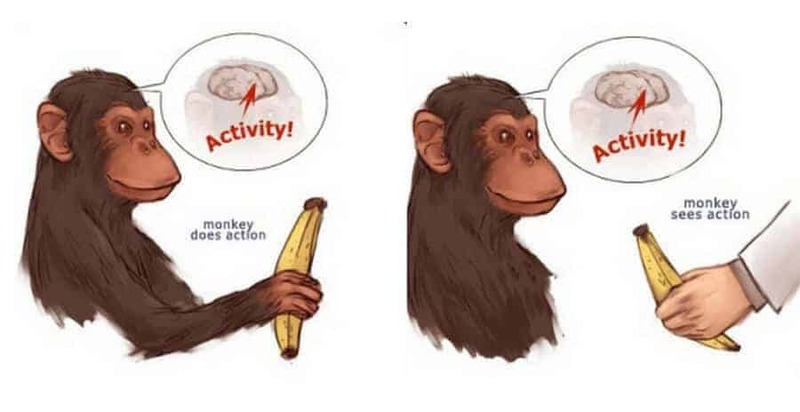 The system fires neurons that replicate or “mirror” the behavior of another person as though you were the one acting in that way. By learning about your employees on a more personal level– their goals, challenges, and motivations– you can mirror what they’re feeling. This helps you understand and empathize with them better. 1-on-1s are the most natural place to do this. From the context of emotional intelligence, it’s no surprise why they’re so effective. They’re the single best way to learn about your employees on a personal level. By making an effort to learn how your employees feel and think, you can come to understand them on a deeper level. You can learn all kinds of vital things about your employees by sitting down with them for even 30 minutes, whether it’s for a 1-on-1, having a chat at lunch, or during happy hour at a local bar. This sustained time opens up deeper relationship building than happens when solely focused on work or small talk that happens in tiny bursts. Learning to empathize with team members help you do more than just understand them better. It also makes you a better mentor. Remember the 4 quadrants from before? Mentoring falls within the relationship management quadrant of emotional intelligence skills. According to researchers Rose Opengart and Laura Bierema from the University of Georgia, employees who receive mentoring achieve higher positions, pay, and career satisfaction. Those are pretty good reasons to mentor. 1 on 1s are the perfect time to do this. They give you the ability to pass on knowledge and support your employees to help them grow. 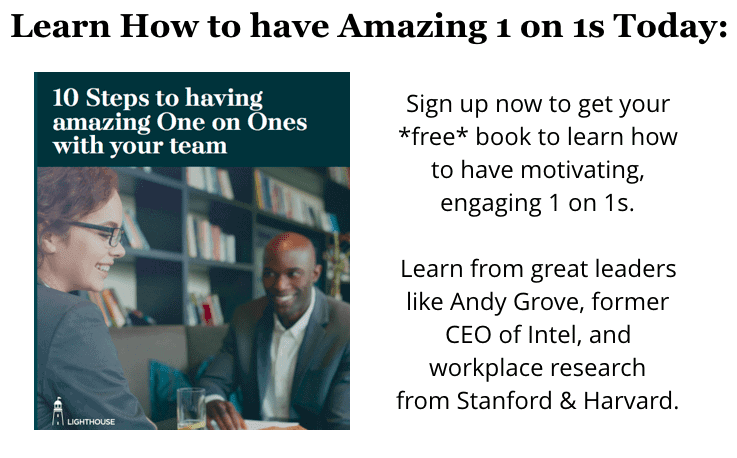 And best of all, you don’t have to find time then; if you’ve already scheduled 1 on 1s, then you can simply add them to your agenda to discuss then instead of trying to squeeze in another time for it. 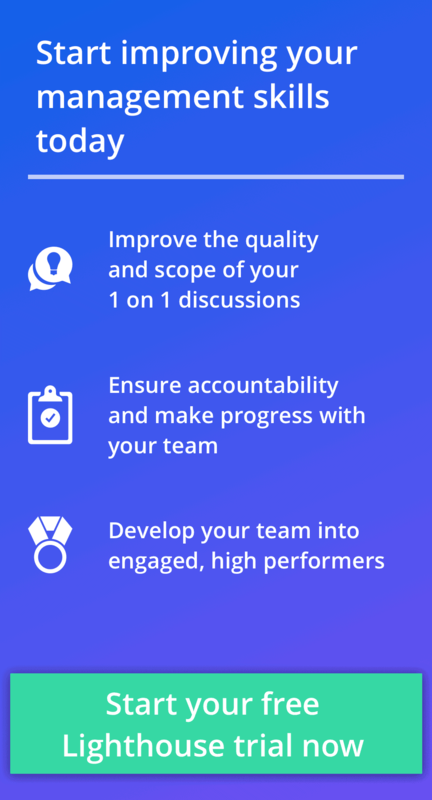 1-on-1s offer a platform for your employees to express any challenges they might be facing so that you can work through them together. That could relate to their role, specific work they’re doing, or a conflict with another team member. You’re then able to offer your knowledge and experience to help them and develop a stronger bond. Learn how to have a great conversation to help them achieve their goals here. Develop more empathy by getting to know them better with some of these rapport-driven questions. Invest in better 1 on 1s, with helpful structure, reminders, and suggested questions with a free trial of Lighthouse here. Are you developing your emotional intelligence? The great part about emotional intelligence is it’s a skill you can learn and develop. There are quite a few different skills that fit within the ‘emotional intelligence’ umbrella. Fortunately, these skills are all inter-related so you can often learn them together. Even companies like retail giant Tesco have seen the value in investing in emotional intelligence with great results. The company experienced its first profitable quarter in almost 4 years after implementing an empathy and kindness training program for their teams. As a leader, your employees look to you to establish important parts of your team’s culture: from communication habits to the willingness to taking ownership for your mistakes. Almost all of these are tied to your emotional intelligence. No matter what you do to develop your emotional intelligence, work to identify your weaknesses. Be conscious about how you’re developing those areas moving forward so you can give the best of yourself to your team.